Celebrate Australia Day in Yass Valley with a range of fun filled community events. Start your morning off celebrating our national day by enjoying the Community BBQ Breakfast at Coronation Park (from 7:30am), followed by the Citizenship Ceremony and Australia Day Awards! There is plenty to keep the kids occupied with face painting, a jumping castle and of course the Coronation Park playground! Just bring a chair, or picnic blanket and enjoy the morning festivities. If that’s too early for your celebrations to begin, then spend the morning wandering the Murrumbateman Village Markets, at the Murrumbateman Recreational Ground from 9:00am – 1:00pm. Collect a variety of locally made goods, food and produce to enjoy on Australia Day with your friends and family, or spending the afternoon amongst the vines at our award winning local Australian wineries that surround Murrumbateman. 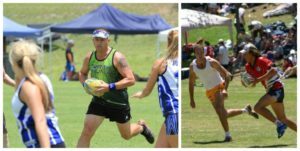 For an action filled Australia Day head to Walker Park and watch the 2019 Yass Touch Knockout teams battle it out for $15,000 in prize money. Beat the heat with a dip in one of our local pools at either Yass or Binalong Pool. 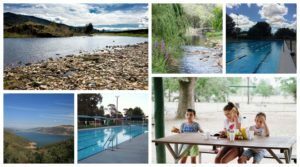 Or cool down with a scenic day by the water at Burrinjuck, Good Hope, or Wee Jasper. Pack a picnic and the cricket set and settle in for the day. Be adventurous and enjoy true blue fun at the Binalong Hotel with yabby races and the annual Australia Day ping pong competition Binalong. Yabby races will also be held at the Australian Hotel in Yass at 2:30 pm on Sunday the 27th. Celebrate our historic past by visiting Cooma Cottage, Railway Museum and Yass & District Historical Museum open days. Still lost for Australia Day ideas? 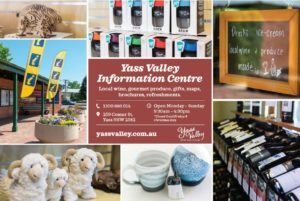 Then drop into the Yass Valley Information Centre and we will happily tailor an itinerary for you. - View all articles by Georgia Patmore.